I'm soooo excited! My favorite blue women are in town tonight at the Egg and I am ready to sing along at the top of my lungs!! The Indigo Girls are hands down my very favorite group. I heart them!! Great music, really good and positive messages and they usually do good work too by collecting food for local food banks, etc. I intended to do a review on here of their newest album, Poseidon and the Bitter Bug, a few weeks ago but of course I never got around to it. I like it. Don't love it as much as others because it is very, very mellow. Which is nice and relaxing but not quite as fun as some of their previous albums. No fun rock-and-roll type songs this go-round. But the tunes and lyrics are just as brilliant as always. And my two favorites are "Love of Our Lives" and "Fleet of Hope." So I certainly hope they play both of those tonight. Regardless of what they play, it is sure to be a fabulous show! Say hi if you see me- I'll be the preppy blonde (who needed to get her hair done a good month ago- oh the shame!) likely wearing pink. Oh, I also did something to my back. I have no idea what or when or how but my lower right back is killing me. Has been for about a week now. Perhaps I kicked too high (and the room erupts in laughter!) doing a Billy Blanks (crappiest quality ever- which makes it so extra funny) Boot Camp video a week or two ago? I have now taken to using my heating pad as much as possible. Sometimes I lead the life of an 85 year old! I'm pretty sure you and I live very close to each other!!! I only know of one EGG and I can see it from my awesome view of the Cap Dist. 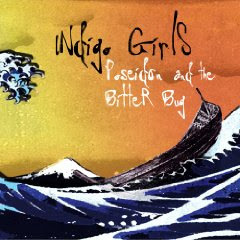 I love the indigo girls!! Hope you have a blast!! This sounds like fun Miss PPC, we are hoping you have a blast! Oh I am so jealous!! I love the Indigo Girls. I can't wait to hear all the details!!! enjoy the concert, and take it easy with your back!! I saw them in Nottingham when I studied abroad in England in college. They've been playing their new stuff on WMVYRadio.com from Martha's Vineyard, that I listen to at work. It's great.